Find your Pretzel Bites coupon in your email. Fill out as much info as you want to. It'll help us send you more deals you like. Signature Mellow dough twisted into pretzels: Choice of garlic butter and parmesan with a side of Mellow red sauce or garlic butter and kosher salt with a side of mustard. Calories listed per pretzel. French bread topped with melted mozzarella, then baked. A rich, creamy soup flavored with Burgundy wine and herbs. 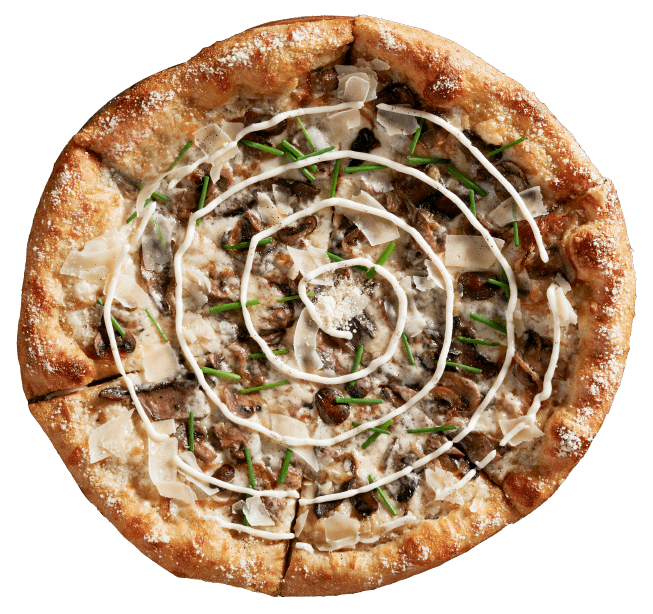 Topped with Italian MontAmoré®, grilled shiitake, button and portobello mushrooms, and fresh chives. Add all-natural chicken or applewood smoked bacon for an additional charge. (cal 100-160) Available in lil' or regular size. Fresh spinach topped with dried cherries, apples, house-made candied pecans and feta cheese. Customize to your taste with additional cheeses and fresh ingredients below. All pizzas are served as large - 8 slices, medium - 6 slices, small - 4 slices. Calories listed per slice. Thin crust available upon request. Choice of CLASSIC crust or Mellow THIN CrustAll pizzas are served as large - 8 slices, medium - 6 slices, small - 4 slices. Calories listed per slice. Thin crust available upon request. 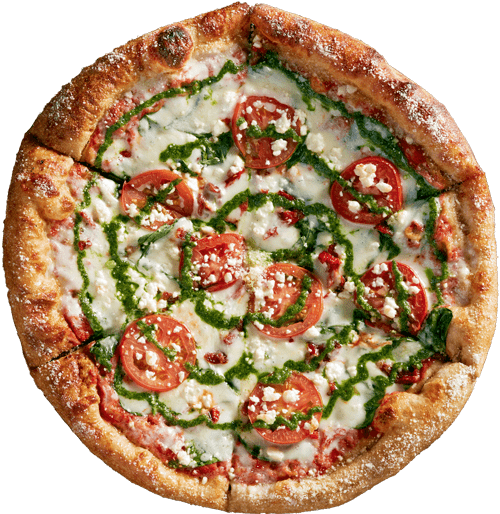 Olive oil and garlic base with sun-dried roasted tomatoes, provolone, feta cheese, seasoned ricotta, fresh basil, mozzarella, roma tomatoes, and onions. 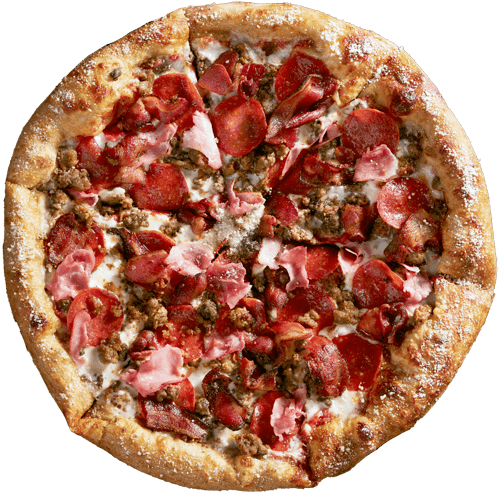 Mellow red sauce base with mozzarella, pepperoni, sausage, ground beef, ham, applewood smoked bacon, mushrooms, black olives, roma tomatoes, green peppers, and onions. Topped with extra mozzarella. Mellow red sauce base with mozzarella, ham, bacon, caramelized onions, pineapple, and jalapeños. Olive oil and garlic base, shiitake, button and portobello mushrooms, caramelized onions, mozzarella, and MontAmoré®. Finished with a garlic aioli swirl and a spritz of black truffle oil. Garnished with fresh chives and shaved parmesan. Any pie can be made on a gluten-free crust; however, only those pies and ingredients with the GF designation can be made with our allergy-safe procedures. Additional gluten-free items may vary by location; ask your server for details. Don’t see your old favorite? Ask your server, we may be able to make it for you. Our tofu, tempeh, and all-natural chicken and steak can be prepared in your choice of our sauces: BBQ, buffalo, herb vinaigrette, jerk, pesto or teriyaki. * These items are so good they count as two ingredients. Mellow red sauce base and mozzarella on Mellow’s crust, buttered and sprinkled with parmesan. Grilled, shaved all-natural ribeye steak or grilled all-natural chicken with mushrooms, onions, green peppers, seasoned ricotta, mozzarella, and provolone. All hoagies are served on a French roll or multigrain roll. [Sandwiches, & Burger]All hoagies are served on a French roll or multigrain roll. Your choice of teriyaki tempeh or tofu with provolone, onions, mushrooms, green peppers, mayo, lettuce and roma tomatoes. 8 oz. of 100% USDA-certified choice, all-natural black angus beef, from family-owned and operated Harris Ranch. Finished with swiss, caramelized onions, garlic aioli, romaine lettuce, sliced tomato and pickle slices. Served on a grilled brioche bun. All BYOB burgers are dressed with lettuce, tomato, pickle, and onions. *All burgers may be cooked to order. Unless otherwise requested, hamburgers are cooked to an internal temperature of 155˚. Consuming raw or undercooked meats, poultry, seafood, shellfish or eggs may increase your risk of foodborne illness. Water, organic cane sugar, lemon juice, strawberries, lemon zest. Strawberries, mangos, water, organic cane sugar, orange juice, lemon juice. Whole milk, cream, caramel, organic cane sugar, pure vanilla extract, sea salt. No plain Jane brownie here. This one’s a buttery chocolate, chewy brownie generously studded with HERSHEY’S® KISSES milk chocolate, bittersweet and semi-sweet chocolate chunks.